Grab your Crockpot to make these delicious Slow Cooker Honey Garlic Meatballs. They are great as an appetizer for party food or use them for a main dish too. Place meatballs in slow cooker. Mix together all remaining ingredients. 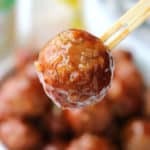 Add sauce to meatballs and stir to coat.